In a sharp reaction to Manipur Chief Minister N Biren Singh’s much publicized ‘Go to Village’ campaign, the president of Komrem Mothers’ Association, alleged that the mission conducted at Samulamlan block, Tuiringphaisen village, Churchandpur has failed to give old age pensions to deserving villagers. Serto Abi Kom, the president of Komrem Mothers’ Association, while addressing the media at Manipur Press Club in Imphal said the villagers are complaining that the Indira Gandhi National Old Age Pension Scheme (IGNOAP) has failed to give benefits to the deserving villagers who are of the Kom community. She alleged that as a part of the campaign, concerned officials arrived at Tuiringphaisen village to deliver old age pension, but only two persons were entitled for the same. 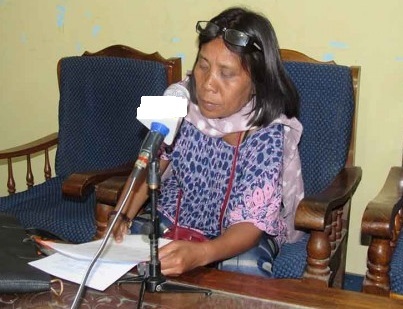 “It is very unfortunate that the names in the list are all names of Kuki people who do not reside in the village which is constituted mainly of Kom people,” said Serto. She further alleged that the names were all fictitious. There are sixty households of Kom tribe, fifty households of Hmar tribe and only six household of Meitei in the village. She appealed to the state to make the benefits reach the genuine and needy villagers. Notably, the third chapter of the ‘Go to Village’ mission was launched across the State on Tuesday. ‘Go to Village’ mission was launched by Chief Minister, Biren Singh with the objective to deliver government schemes at the doorstep of the beneficiaries. It was launched throughout the State covering all the villages of 60 Assembly constituencies.